Financial help has been pledged to Wetherby residents to fund their legal fight against an “outrageous” development on the outskirts of the town. The application by Hallam Land Management, for 210 homes off Harrogate Road at Stockeld, met with hundreds of objections but Harrogate Borough Council (HBC) passed the plans last week. Better Wetherby Partnership, which was recently formed to help sympathetic planning in the town, condemned the decision and on Monday held a meeting to discuss how to stop the development. Chairman Peter Swales said: “We identified what next steps we should take following the outrageous, ill informed and anti-democratic decision made by Harrogate Borough Council. “It was very pleasing to receive the high number of responses for funding a Judicial Review with over 90 per cent of respondents willing to contribute financially. Following last week’s decision Wetherby Ward councillors have been working to stop the development. They said options available include taking Harrogate Borough through a Judicial Review procedure to investigate whether they followed their own process in the making of this decision. “Alternatively, a request could be made to the Secretary of State to ‘call in’ this decision,” said a ward council spokesman. Harrogate Planning Committee met on September 25 to re-consider the decision to reject the outline planning application from Hallam Land Management, for 210 homes just off Harrogate Road at Stockeld. The application was approved 9-0. At the previous Planning Committee meeting in August, Harrogate members voted to reject the application by 11 to 1 before officers moved to defer the decision pending exempt information. Coun Alan Lamb told the Wetherby News this week: “We are still shocked, disappointed and baffled about this decision, given it has been based on information that was not available in the public domain. That is not how democracy works. “It was not at all clear during the meeting that the panel members had considered the exempt information at all. “People can accept an outcome they disagree with if the process is fair and transparent and the reasons make sense. That was not the case here. The ward councillors laid on a coach to take objectors to the planning meeting last week, to prove strength of feeling about their opposition to the plans which they say will put a huge strain on Wetherby’s infrastructure and services such as doctors. Following the decision which has been branded as “outrageous”, the Ward Councillors have been canvassing opinion on which course of action to take and will make an announcement on their preference in the future. Coun Norma Harrington said: “All options are still open, and we need to work out the best way forward – looking at all angles including cost and what is the outcome if we were to win. Coun Gerald Wilkinson added: “This is a very disappointing decision and we will not accept it without exhausting all appropriate avenues of challenge. 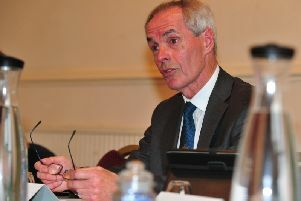 Chairman of the Better Wetherby Partnership Peter Swales said the planning decision has far reaching consequences. “We stress again we are not against development, but we believe development has to be planned. “Stocked Park’s strategy for the Harrogate Road, Wetherby site, which was rejected from Harrogate’s draft Local Development Plan, was to pursue the application for approval on the technicality that Harrogate’s Plan had not been approved yet. “What is therefore essentially a loop-hole represents an unintended consequence for the people of Wetherby and surrounding villages. “It will lead to the ruination of Wetherby. Defending the development, the agent for the applicant, Mr Irving told the committee last week: “All large scale applications and indeed many small ones attract objections. “It is understandable as people who reside in an area where a planning application is presented often may not want change as there is always a perceived negative impact and we are always presented with the question why can’t it go somewhere else?’.